Do you like organic food? Love the country-side? Like making new friends? Then you should definitely make a trip out to Farm Kitchen located in Poulsbo, WA. 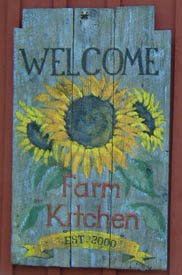 Farm Kitchen is an eighteen acre organic farm which offers the First Saturday of the Month Breakfast. Treat the family to a short ferry ride and drive out to Farm Kitchen and you'll be treated to an organic, farm fresh breakfast! The First Saturday Breakfast is Year round. Each month Farm Kitchen offers a Featured Breakfast for $9.75 and a selection of side orders from $3 - $5 each. No reservations are needed. Breakfast is served between 8:00 am to Noon. A previous menu from a First Saturday Breakfast included: Scrambled Eggs, Thick cut Bacon, Roasted Potatoes, Orange Cranberry Scone, Fresh Fruit. You can also try one of their many fresh pastries: Cinnamon Rolls, Cherry Danish, Orange Cranberry Scones, Yummy Orange Rolls Hollis's Original 8-Grain Pullaparts, Pecan Sticky Buns and many others! Farm Kitchen is owned by Hollis Fay and Anne Thatcher. According to their website, they "created Farm Kitchen to be a place where events are celebrated in a gracious country setting with friends and great food." Do yourself and your friends and family a favor and head on out to Farm Kitchen for a wonderful breakfast experience. You can find out more information about Farm Kitchen, First Saturday Breakfast and their other events at their website at http://www.farmkitchen.com/.